At an amazing altitude of 2730 meters above sea level the hill resort of Gulmarg in the Baramulla district of Jammu and Kashmir has been alluring to the visitors for its magical meadows and mountains for a long time. Endowed with nature’s bounty in the form of snow-capped Himalayan mountains, lakes, streams, the cup shaped meadow of Gulmarg has been a locale marveled at by Bollywood directors including Raj Kapoor. A popular day trip from Srinagar, Gulmarg, which literally means 'Meadow of Flowers', is the ultimate destination for adventure seekers thanks to its grassy slopes. As a matter of fact, it ranks as Asia's only heli-skiing resort. By visiting the mesmerizing hill station of Gulmarg, 57 km southwest from the capital city of Srinagar, tourists can enjoy one of the most wonderful natural wonders of the world. A 600-metre ascent from Gulmarg will take you to Khilanmarg from where one can have the stunning view of the soaring peaks of Nanga Parbat, the fifth highest peak in the world, Nun and Kun. A thirteen km trip to the picturesque alpine lake of Alpather from Gulmarg will be an unforgettable experience. Nestling at a height of 4511 metre in the Apharwat mountains, the lake looks mesmerizing thanks to snow floating in its waters. With miles of walks on the famed Outer Circular Walk through dusky pine scented forests the tourists get the opportunity to marvel at the jaw-dropping beauty of the Kashmir valley. For the picnickers, the mountain stream of Ningli Nallah cuts through pine forests providing several picnic spots. Another important stream is Ferozpore Nallah which meets the Bahan River at a point known as 'waters meet' where one can indulge in trout fishing. If you want a brush with divine you can visit the Ziarat, or tomb of Baba Reshi, a well-known Muslim mystic saint who lived at the court of the greatest Muslim ruler of Kashmir Zain-ul-Abidin. For those interested in wildlife, Gulmarg Biosphere Reserve is a place to be. Occupying an area of 180 sq km, the reserve is the natural habitat of the Himalayan Musk Deer, Red Fox, Brown and Black Bear as well as several species of local and migratory birds. 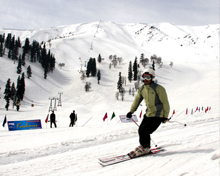 Last but not the least, those who like adventure sports love Gulmarg. Skiing is the main activity that can be enjoyed at this premier hotspot of adventure sports is skiing. 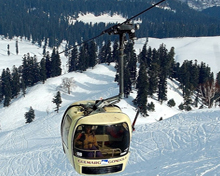 The Gondola cable car, one of the highest largest cable cars in the world, provides the longest ski run in Gulmarg. A ride in the Gondola ropeway through the pine covered slopes will be a thrilling experience. Gulmarg is appealing to the discerning golfers who throng here to play golf in the world's highest green golf course. 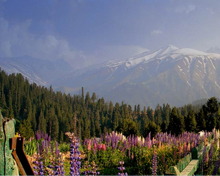 Gulmarg has a wide array of accommodation options to choose from to suit all budgets. Majority of them are equipped with the basic amenities to make your stay in this hill station comfortable. You can travel to Gulmarg throughout the year. The winter months from November to February are perfect for skiing. To escape the sweltering heat of the plains, the summer months from May to September are ideal for making a trip to Gulmarg. Gulmarg valley is also well connected for air and rail transport. While the nearest airport is at Srinagar, Jammu is the closest railhead.